What Is a General Education Diploma? 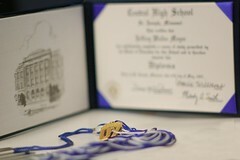 For those who have not had the chance to earn a high school diploma, other people might have told them that they can still go try and earn a general education diploma, or commonly referred to as a GED. What is a GED anyways? As you may have been able to tell, a GED is a substitute for the traditional high school diploma and represents that the GED holder has a fundamental academic understanding in the categories of math, science, reading, writing, and social studies. To be eligible for the General Education Diploma, an individual must be at least sixteen years of age and not be currently enrolled in a high school. Often times, identification and school withdrawal papers must be presented on the GED test day to verify a person’s eligibility. The GED test asks test takers questions about facts and concepts that they would have learned in high school, and is all multiple choice except for the writing portion of the exam, which requires an essay to be written. The entire GED test is approximately seven hours long, and some GED Testing Centers might require you to take the test in one sitting. Other GED Testing Centers, however, may be more lenient and allow you to spread the test over a course of two to three days. Individuals can score as low as 200 and as high as 800 on each section of the GED test. To pass the GED test, a minimum score of 410 per section and average of 450 for all five is needed. People who were not as well prepared as they liked and failed to pass need not to worry, since the GED test can be taken over and over again. People are usually required to wait, however, for a certain amount of time before they can retake the test again. So why should anyone earn a GED? For one thing, it keeps your options open. Whether or not you decide to go to college to further your education or start working immediately, a GED serves as a tremendous boost to your profile. Compared to applicants with no qualifications whatsoever, if you have a GED, others recognize that you care about your education, and are more likely to accept you as an employee for job or student for a school. No matter what your plans are, getting a GED will provide you with more opportunities.